Fri, Mar 23, 2018, 08:20 am SL Time, ColomboPage News Desk, Sri Lanka. 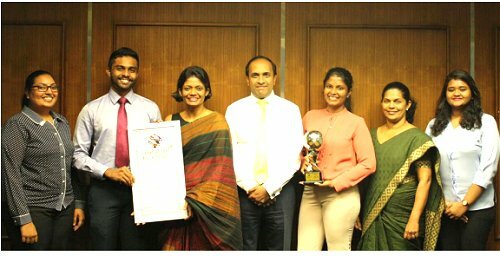 Mar 23, Colombo: The Colombo Stock Exchange (CSE) won the award for Best Workplace Practices at the recently concluded World HRD Congress in Mumbai, India. The Global HR Excellence Awards, which held its 26th edition at the 2018 World HRD Congress, recognizes HR leaders and organizations for developing innovative HR practices that drive the company and its workforce. The World HRD Congress in 2018 attracted the participation of over 1400 HR professionals representing over 130 countries. A number of initiatives directed at improving operational efficiencies including the automation of routine processes, instilling analytics driven HR practices, and employee recognition and appreciation initiatives played a pivotal role in achieving this recognition. Commenting on the award, Ms. Prashanthi Sabesan, Head of HR at CSE said "We are pleased to accept the Global HR Excellence Award for Best Workplace Practices as a strong endorsement of our continuing effort to build a tradition of best practice and quality driven HR in the organization. CSE in recent years has offered special emphasis to strategically developing the HR function." Recent HR related awards won by the CSE include recognition at the 2016 IPM National Conference with a Gold Category Award for HR Excellence and a win at the 2016 edition of the World HRD Congress for 'The Most Innovative Use of Training and Development'. In addition, CSE was recently awarded the ISO 9001: 2015 Quality Management System certificate for HR by Bureau Veritas Certification Holding SAS - UK Branch, confirming the implementation of a quality management system for HR.